Game On for Information Literacy is a card game to help educators brainstorm and create games for information literacy and library instruction. Full rules and Creative Commons-licensed materials are available to download, reuse, and remix (below). I created this game to use in classes, workshops, and other professional development contexts to introduce educators — including librarians and LIS graduate students — to developing instructional games. Many who teach are interested in using game-based learning, though they may find it challenging to get started, especially those who are not themselves gamers. This game offers a low stakes, fun introduction to creating games for library and information literacy instruction. Game materials include three decks of cards: one deck of Information Literacy Goals, one of Mechanics, and one of Games. The IL Goals deck is inspired by the ACRL (Association of College & Research Libraries) Information Literacy Standards; each goal is is phrased as a student learning outcome. The Mechanics deck includes common game actions like collecting, running, and role play. The Games deck features well-known card, board, digital, and other games, and includes a description of each. There are 20 cards in each deck, and one complete set of cards can be used by up to 20 groups of players. A worksheet is also included to facilitate each groups’ recording their game notes and sharing the details of the game they created. All game materials are available to download in both PDF (just print and cut out the cards) as well as modifiable formats for further customization. For best results, print the cards on cardstock. If you download and use (or mod) this game, let me know how it goes! I’m very interested in feedback. Time involved: About 45-60 minutes for gameplay and report back for a group of 20. Divide the players into groups of 3-4. Each group draws 1 card from each deck: IL Goal, Mechanic, and Game. Players spend 15-20 minutes brainstorming a game to teach their IL Goal using their Mechanic and Game. Each group uses the worksheet to record their game notes. Each group reports back on the game they created (and the process). When introducing the gameplay it’s useful to give an example of how the game works, that is, draw (or pre-arrange) 3 cards and demonstrate the process of creating a game using them. It’s also helpful to have the game rules visible on either a slide or a handout for players to refer to during gameplay. In the event that all members of a group are unfamiliar with the Game card they received, another card may be drawn in its place. If there are only one or two members who don’t know the Game on their card, the other players can be asked to explain it. 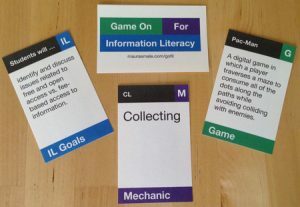 It’s important to note that players need not use every aspect of the Game card to create their new game: the new game does not have to be an “information literacy-flavored” version of the Game on their card. Taking a few (or even just one) aspect of the Game on their card into account when creating the new game is fine. For example, a group may draw Checkers and decide that their new game will involve two teams of players. It might be helpful to reassure players that the gameplay is meant to provide an introduction to game-based learning for library instruction — there’s no expectation that 15 minutes of brainstorming will produce a fully-formed, complete game (though if that happens, terrific! ).